From judo and karate to ice hockey, Vladimir Putin’s love of sports has been well-documented. But what were the sporting interests of the country’s previous leaders and how did their patronage affect the national standing of those disciplines? RBTH finds out. Lenin was an avid chess player, Stalin preferred the Russian folk game gorodki, Brezhnev was a first-rate swimmer and Putin, who just recently started skating, is already participating in hockey matches. A look back through the Soviet period and more recent times reveals a curious pattern: As soon as the country's leader takes up a sport, it immediately obtains a national significance - and in many cases the nation then goes on to achieve success in the sport on an international level. The founder of the Soviet government was a great admirer of chess. 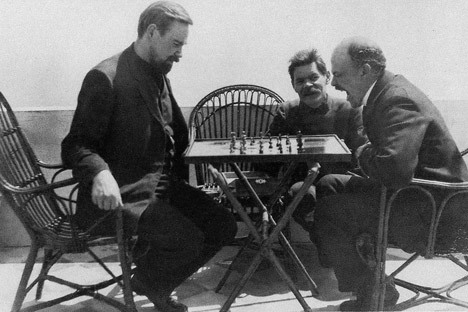 Today we can see a series of photographs taken in Italy in 1908 in which Lenin is playing an intense game of chess with another Bolshevik, Alexander Bogdanov, while the celebrated Russia author Maxim Gorky looks on. In fact, it was Gorky whom Lenin had come to visit. During his exile in Europe, Lenin also took up bicycling, which in those days required a considerable amount of courage, since bicycles were not easy to ride and some streets, such as those in Paris, were outright dangerous. In 1910 Lenin even got himself into an accident. Later, in a letter to his mother Maria Alexandrovna, he described the incident: "I was riding from Juvisy and the automobile flattened my bicycle (I had managed to get off). The crowd helped me write down the license number and acted as witnesses. I discovered the owner of the automobile (a viscount, darn it) and am now suing him… Hope to win." Lenin actually won the lawsuit, received from the viscount the amount due, bought a new bicycle and continued his unsafe rides. After the October Revolution the first types of sport to be encouraged and developed were cycling and chess. The first large cycling competition took place in 1918, while the first RSFSR chess championship followed in 1920 (Alexander Alekhin, the future champion, was the winner). "The government understood that chess is a part of the educational system, that it can contribute to elevating the nation's culture and to battling illiteracy in a poor country," says world chess champion Anatoly Karpov in the documentary film Three Giants of Soviet Sport. Other types of sport also received government support at the time (except for tennis, which was considered a "bourgeois pastime," and a few other unlucky disciplines) and became more popular than they had ever been during tsarist times. The government dedicated itself to creating a healthy nation. Joseph Stalin was also no stranger to sportive amusement. His contemporaries remember that he enjoyed playing gorodki (a game in which players attempt to knock down wooden ‘cities’ by flinging batons down a court). Famous aviation constructor Sergei Ilyushin wrote in his memoirs that, "Stalin listened, not uttering a word. For almost an hour. Having understood that a solution was nowhere to be found, he finally stopped the discussion and proposed to 'go and play gorodki instead.' Everyone agreed willingly and for four hours there was an enormous fuss on the gorodki court. Stalin was a keen player, skillfully knocked down the pieces, bantered with the losers…"
How to play the ancient Russian game of gorodki? However, big sports were not well developed during Stalin's time: Soviet athletes usually competed with members of the other countries' working class, not with the cream of the crop. This was partly due to political reasons, partly to the sports officials' pathological fear of losing. Nikolai Romanov, who headed the Department of Sport after WWII, wrote: "Having decided to participate in competitions abroad, we were obliged to bring back a victory, otherwise the 'free' bourgeois press would throw muck not only at the Soviet athletes but also at our entire nation… It had already happened on several occasions. In order to receive permission to go abroad and participate in international competitions, I had to send Stalin a special note promising a victory…" This is why the USSR made its Olympic debut only in 1952, despite Soviet athletes having been invited much earlier. Stalin's son Vasily, an ex-fighter jet pilot and guardsman, made a great contribution to Soviet sport, however. During the post-war years he created and managed an entire series of teams assigned to the Air Force. The most famous were the soccer and hockey clubs VVS (Vataga Vasiliya Stalina - Vasily Stalin's Crew, as it was called), which produced stars of world renown. Vasily Stalin, by the way, was married at the time to USSR swimming champion Kapitolina Vasilievna. After Stalin’s death, the new Soviet leader Nikita Khrushchev, who did not particularly enjoy sports, had an ambiguous influence on Soviet sport. It was he who gave his blessing to the trial of Olympic champion Eduard Streltsov, erasing eight years from the career of this legendary soccer player. However, it was Khrushchev's committees that organized the first USSR Spartakiad, which was a domestic version of the Olympics. Khrushchev's successor Leonid Brezhnev was a first-rate swimmer and racecar driver, and loved to watch hockey and figure skating. It was during his era that these two sports entered their golden age. Brezhnev was a CSKA (Central Sports Army Club) fan, which is why the army hockey players and figure skaters were the best in the country, and sometimes even the world. Brezhnev wrote in his personal diary: "1978. March 9. Presided over the Politburo. Hosted [Palestinian leader Yasser] Arafat. Saw a hockey match… May 1. Went to Red Square, saw a demonstration. In the evening watched a hockey match between the USSR and Finland - 10:2." Russia's first president Boris Yeltsin used to remember his school days like this: "…I was immediately captivated by volleyball, and I could play for days on end. I liked that the ball listened to me, that I could jump up and take even the most hopeless ball… My left hand is missing two fingers, that's why I had difficulties receiving the ball, so I devised a special way of receiving it, a special way of holding the left hand, and now I have my own, unconventional way of receiving the ball…"
Yet it was in tennis that Yeltsin's true passion lay. Thanks to his interest, this sport received substantial financing and TV attention. The men's national team, which until then had never scored any victories, twice became champion of the Davis Cup, the world's most prestigious team tennis tournament (2002 and 2006). "Yeltsin greatly contributed to the evolution of Russian tennis," former USSR team trainer and presidential physical education advisor in the 1990s Shamil Tarpischev told Itogi magazine. "Members of our government had always played tennis. Even Molotov and Beria occasionally took to the court. And when Yeltsin appeared in front of everyone in shorts and with a racket, it was as if he had rediscovered the sport anew." In more recent times, Russian President Dmitry Medvedev enjoyed weightlifting and canoeing in his youth, and during his presidential tenure did everything possible to promote badminton. His efforts, as it turned out, were not in vain: During the Games in London Nina Vislova and Valeria Sorokina brought Russia its first Olympic medal. The current Russian president, Vladimir Putin, is master of sport in judo and sambo (in which he was frequently a champion of Leningrad) and a black belt holder in karate, judo and taekwondo. Putin is also famous for his interest in Alpine skiing. "He skis on the level of a confident professional - technically very well, fast, but does have an error, which I, when we ski together, try to correct," said President of the Federation of Alpine Skiing and Snowboarding Svetlana Gladysheva in an interview with Izvestiya newspaper. "You can even see by the way he walks that one arm moves too far out, which is also noticeable when he skis." Putin's latest hobby is hockey. He started skating in 2011 and now regularly plays in exhibition matches between veterans of the national USSR team. The best example of Putin's love of sport was the recent Olympic Games in Sochi - winning permission to host the Games in Russia was a matter of principle.